Uncover any home repair issues and insulate your house before winter settles in. 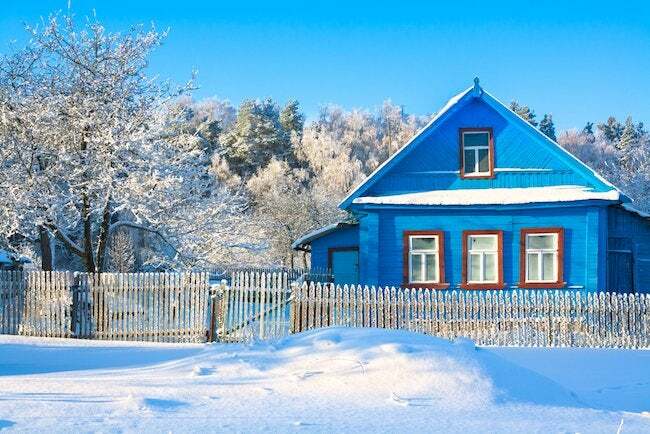 Don’t miss 11 Ways to Winterize Your Home on a Budget! While you were having fun in the sun this summer, it was no vacation for your house. Sun, wind and rain can cause as much wear and tear as snow and ice. A fall checklist will tip you off to some problems before they become nasty mid-winter surprises. Check your house from top to bottom. Start by inspecting the roof with binoculars: Are your shingles worn or failing? Check the attic for signs of leaks around the skylights or vents, chimneys, and have your chimney cleaned once a year. Clear out your gutters and check for leaks there, too. Drain your outside hose spigots if you live where pipes can freeze. Switch your screens for storm windows, and seal any drafty windows and doors. The same goes for paint and siding: make sure you caulk or repair those gaps around windows, doors, trim and vents, and replace any siding that is failing. In the basement, check for dampness on the floor and walls, test your sump pump, flush your water heater and check for any signs of leakage. Clean your dryer vent regularly. Make sure that paints or any flammable materials are stored away from heat sources in a closed metal cabinet. And make that appointment to have your heating system serviced yearly. Do the top-to-bottom check this fall, and you’ll avoid expensive surprises this winter.